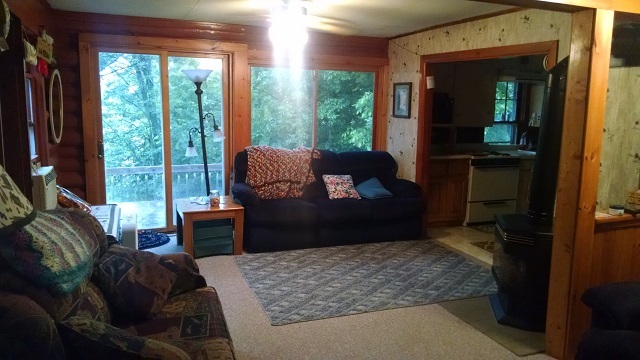 If you are looking for a nostalgic log cabin nestled in over 7 acres of private woods along a beautiful northwoods lake – I have it here for you – and at a very affordable price! Circle B Road is off of Hwy B, about 25 miles east of Hayward, just beyond the bridge over the East Fork of the Chippewa River. You will enjoy the long, winding drive through the woods to your 3-season cabin, and with over 7 acres of land, you have the seclusion and privacy that is so hard to find with a lakefront property. Barker Lake is a 200+ acres drainage lake with medium brown water as is typical of the Chippewa River system it is part of. This lake offers good muskie, panfish and walleye fishing, along with scenic boating. This lake has many active resorts and recreational opportunities also. 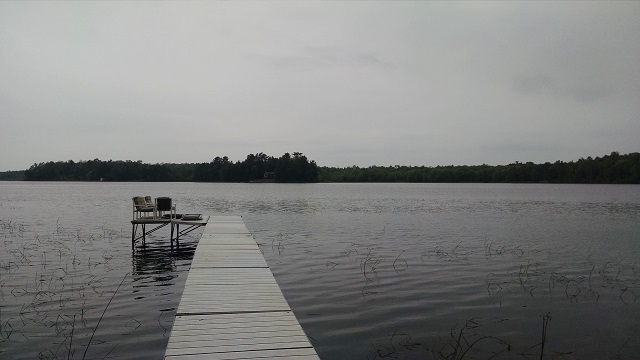 There is a boat launch conveniently located only a few blocks from the cabin on the southwest side of the lake. A short drive to Hayward for supplies or to participate in the many area events or an even shorter drive to Winter for your essentials! 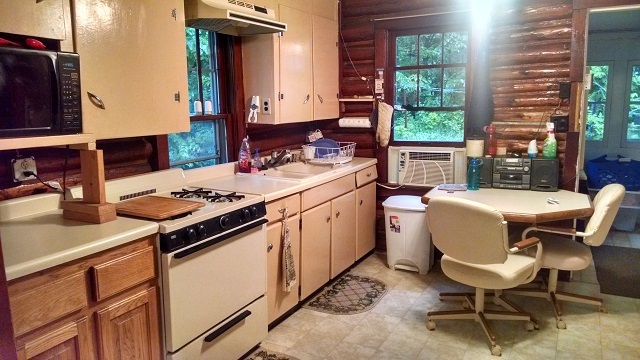 This older 1100+ sq ft cabin features 2 bedrooms with many additional overflow sleeping areas, a roomy kitchen, livingroom and 1.5 baths. 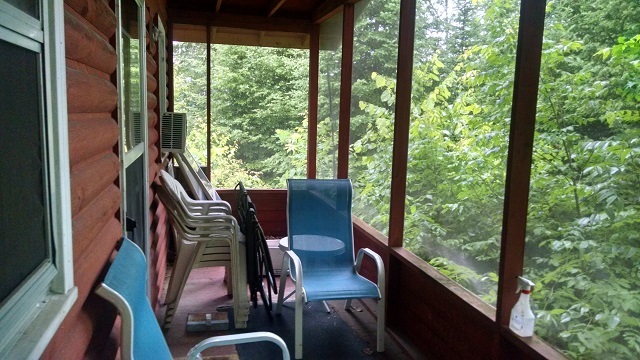 There is a nice glass sunroom porch on the back facing the woods, and a large wood deck lakeside, along with a screened porch off the master bedroom. One full bath is off the side entry to the cabin plus there is a half bath off the master bedroom which has a large area for storage too. There is a smaller bedroom off the master bedroom, so one would have to walk through the master to get to the other bedroom, but when a group of you is up north, I don’t think people care too much about having to do that! There is also a log-sided room between the kitchen and back sunroom that one could use for a den or extra sleeping too. The spacious living area has a gas-log fireplace for those cool fall evenings, lakeside patio doors, and plenty of ceiling fans and wall AC units for hot summer nights too. 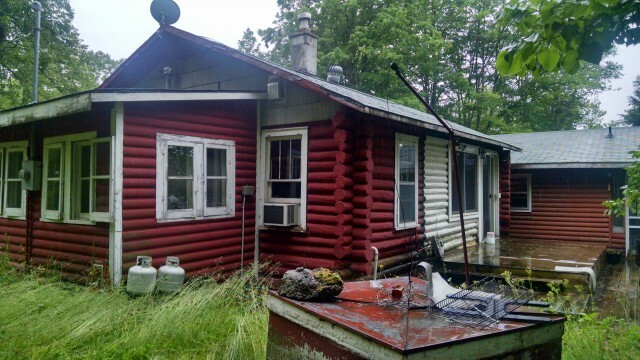 The cabin sits up on a wooded hillside overlooking the lake, and with a short walk down to the lake you’ll find a large, grassy lakeside plateau, a storage shed and a newer dock. Although the cabin can use some TLC in areas and your personal touch in others, the roof is only about 3 years old, the well pump and sump pump are less than 5 years old and the dock is only a few years old. It is listed well below a recent appraisal and is priced to sell – my seller is very motivated so contact me if you’d like to see this cabin! This entry was posted in Cabins For Sale Hayward, FEATURED PROPERTIES, waterfront cabins and tagged area north realty inc, barker lake wi, cabin on barker lake for sale wi, cathy lareau real estate agent hayward, lake cabin for sale northern wi, log cabin for sale hayward wi, log cabin on barker lake for sale, log cabin on lake for sale hayward wi, log cabin on lake for sale winter wi, private lake cabin for sale northern wi, waterfront log cabin for sale hayward. Bookmark the permalink.